I recently turned two giant tote bags a friend got at a con into floor pillows! 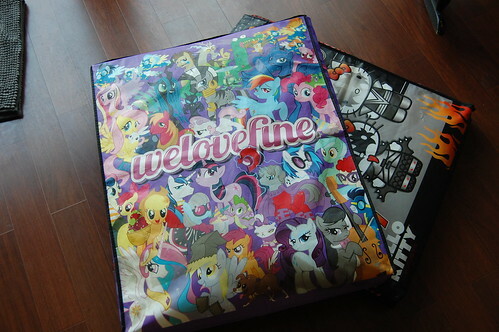 The bags are large (24″ wide) but only about 3″ deep. The project turned out to be extremely easy. We found a foam cushion roll that was the exact width of the bags, and the same size fabric was used for the handle and all the way around the sides and bottom, making it a snap to create a closed side that doesn’t look weird. Per our measurements, it seemed like the cushion wouldn’t be quick thick enough, but it was, and it actually turned out that the extra length could fit inside the whole shebang with no problem. This was a super fast project and also pretty satisfying to MacGuyver together. However, between the foam rolls and the velcro, total cost was probably close to $60, including shipping and taxes. So, not really a cheap hack, more a cool way to create a neat decorative element for her new apartment. 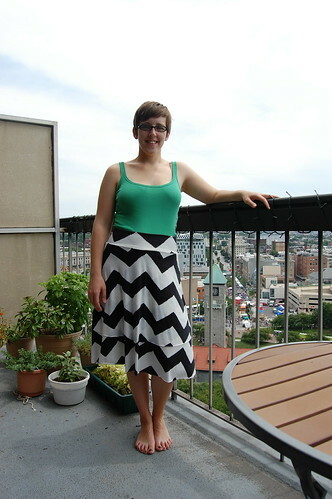 Earlier this summer, I got it into my head that I wanted a striped jersey skirt – a version of Kwik Sew 3513, which I’ve successfully made up previously, that is not relegated to “house clothes” status as my other two are. 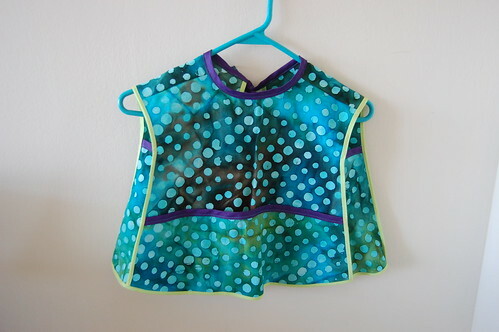 As you can see it turned out really well, and it’s very soft and comfortable to wear – perfect for summer in Maryland. The fabric is from Jo Ann Fabrics, and is a knit called “Famous Maker Fabric Knits.” It’s very thin, so I dithered around a bit before I finally decided to buy twice as much as the pattern called for, and make a double layered skirt. Initially I’d thought that I would finagle things so that the stripes overlapped on the bottom and the overlay, but when I finally set about trying to do this, I decided that was not worth the time. Jersey is finicky enough to smooth out and cut, and ultimately I like that it’s not all matchy-matchy perfect. 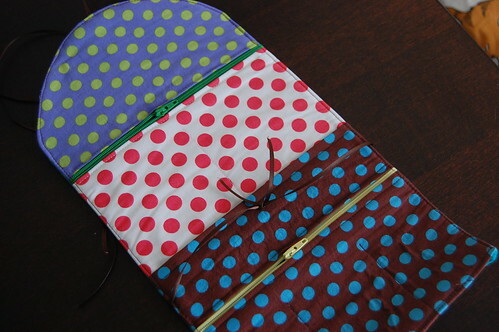 I decreased the width of the waistband, which is designed to be folded over. On my other two versions of this skirt, it tends to hit right at my thickest point, and the folding adds a lot of bulk, which is not particularly flattering. My sewing on the snow day didn’t wind up being at all what I’d planned, but that’s OK. 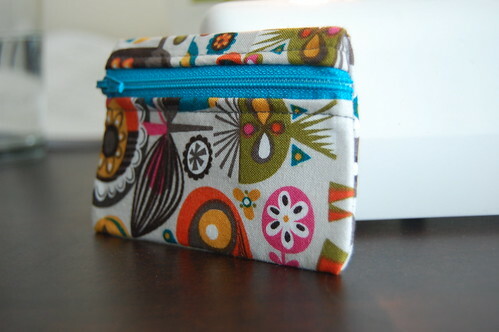 I used up some odds and ends of fabric and made this jewelry roll from One Yard Wonders. This project was one of those things that just kept getting put aside, in favor of more exciting things. I followed this tutorial on Make/Craft, which I had bookmarked a long time ago. 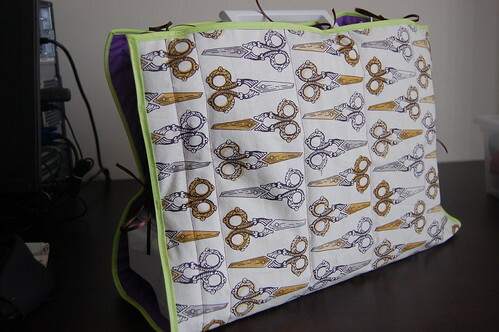 I don’t have a dedicated space for sewing, so I liked the idea of a cover that would still let me access the handle. This has the added bonus of turning the machine – which tends to hang out on the corner of my desk when not into use – into something more aesthetically pleasing. I find that the very basic machine covers, which don’t have a stiff lining to them, look sloppy to me. The tutorial was very easy to follow – basically you make a sandwich with your exterior and interior fabrics and a bit of quilt batting, quilt it however you like (I just did a few vertical lines, and I let the fabric pattern be my guide as to where I put them), put some bias binding on the edges and then add ties. The exterior fabric is something I picked up at Stitch Lab in Austin in October of 2011. I have no idea what it is. The interior fabric is leftover Kona cotton from a quilt project, and the bias binding is a 1/4″ green, chosen because it didn’t clash horribly and I had a ton of it. The ribbon is ribbon I bought for some project that I never made. The batting I also had on hand from the quilt project. So that means this was one of those fabulous fast and easy projects that was basically free, because everything was either leftover from another project, or purchased so long ago as to not count. As I tend to do when following these type of design-your-own tutorials, I messed up the measurements somehow and it isn’t quite as long as I had wanted. If you try making this I would suggest that you cut it longer and wider than your measurements indicate you need – both to incorporate seam allowance (which I did try to do) and to allow for easier adjustments before you bind the edges. If I had this to do again, I would cut it larger, quilt it, see how it fit before I bound it, and then trim it as needed. This will also allow you some wiggle room should things shift around while you quilt, which will inevitably happen. I’d also recommend that you don’t use 1/4″ binding. I did as that’s what I had hanging around in enough quantity to bind this, and as a result I have several spots where the fabric didn’t get caught in the binding. I tried to go in and fix this but it was too fiddly to do without ripping the entire thing apart, which I had no desire to do. So I hit the raw edges with some Fray Check and called it a day. I also didn’t bother to try to hide the edges of my ties under the bias binding, though that would have been a nice touch. This was one of those projects that didn’t take much time at all when I was actually working on it, but there was a long stretch where I wasn’t working on it. Anyway, it’s done and I’m very happy with how it turned out. I haven’t heard the recipient’s opinion yet but he’s very well-mannered so I’m sure I’ll get a thank you when I see him this weekend.